← Missed in Translation: Sidewalk or Sidemarket? 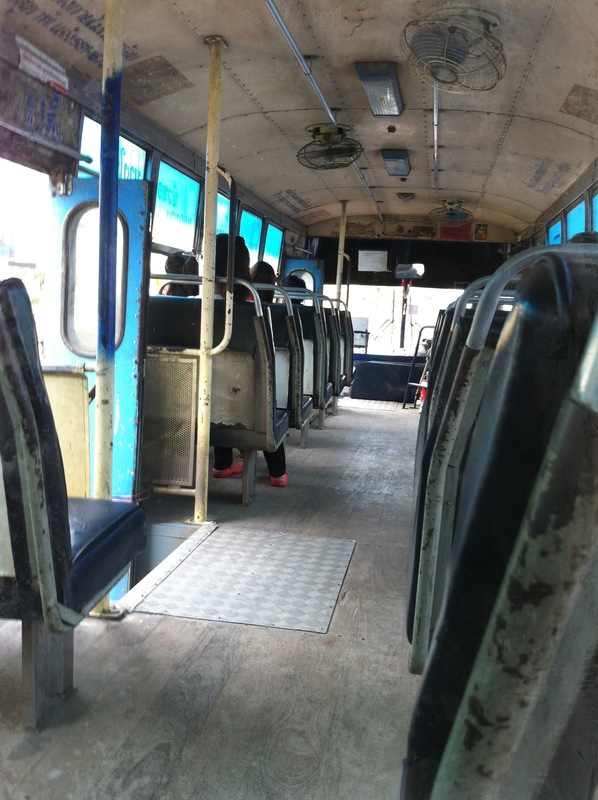 Spoiled Farang no more, I paid my seven baht (7thb) and rode the non-air-conditioned bus. The bus that doesn’t really stop, just eases to a slow roll and you jump on or off. It was fun, I love the ceiling fans. I can now add bus to the list of transportation methods used while in Thailand: car, bus, tuk tuk, train, skytrain, subway, bicycle, water taxi, long tail boat, kayak, barge, speed boat and elephant. This entry was posted in Farang and tagged bangkok bus, Farang. Bookmark the permalink. Can’t say I share your enthusiasm for the ceiling fans which are a hazard for tall people standing when the bus is crowded. Another hazard for the infirm is when the bus doesn’t fully stop to let you get on or off. Ian, surely that is the fun of it? !